Due to natural occurrences, such as drought and wildfires, brought on by climate change, food sources for koalas are rapidly depleting, which is a big cause for concern for their survival. Koalas normally get the water that their bodies require from the eucalyptus leaves that they commonly eat, but due to the current conditions, they have resorted to drinking water, which is a very bad sign, according to recent reports from The Dodo. A farmer called Robert Frend, from New South Wales, Australia, recently took note of how thirsty the koalas had gotten, which proceeded to him helping the researchers at the University of Sydney to bring the animals water. 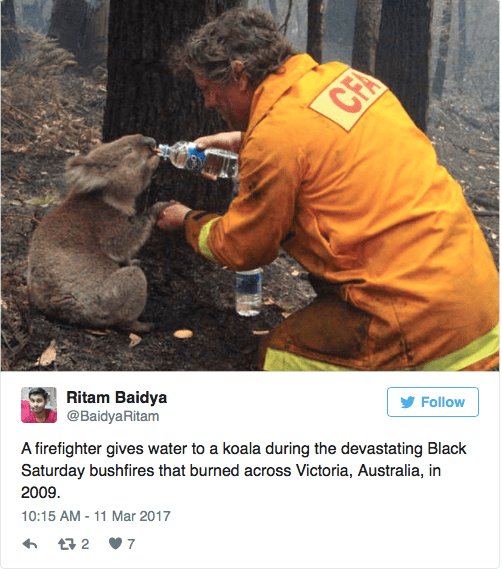 From this, Frend invented a water station that is attached to trees, which he named Blinky Drinkers, and allows koalas to drink as much water as they need. 10 of these water stations were set up at different ground and tree levels, along with surveillance equipment, back in April 2016 in an area that contained sizeable populations of koalas. After examining the recorded footage of the drinking koalas, the researchers were shocked at the findings. They found that the koalas were drinking a lot more water than expected, and even got up during the day, when they are normally sleeping, in order to drink from the stations. All of the stations were visited during their test period, and they recorded a total of 193 visits during the fall and winter seasons when the heat is not too harsh. The results came as a surprise to researchers as they were shocked to see that the animals change their behavior based on climate change, which also evoked a worry for the survival of animals in the future.